Make someone happy with homemade chocolate birthday gifts. You can make cookies, a cake, personalized cupcakes. My favorite is homemade fudge, which I'll be sharing the recipe. 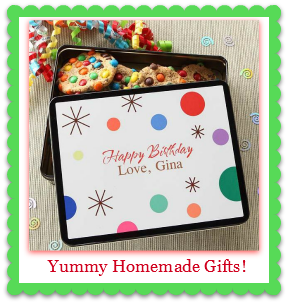 What can make the gift even more special is if you put your gift in a personalized gift tin. My sister, Nancy, gave me this recipe and I think of her every time I make it. On low heat melt butter, add evaporated milk and sugar. Cook until sugar is dissolved. Increase heat to medium. Bring mixture to a rolling boil then cook for an additional 12 minutes - stirring frequently. Remove from heat and add marshmallow cream and chocolate chips. Stir until well blended. Add nuts. Pour into 9x13 inch greased glass pan. Makes 5 pounds. More than enough for the one of the most perfect homemade gifts ever! Here are some beautiful tins. I especially like the ones that you can put a picture on. These would really help make your homemade chocolate birthday gifts special. Create Your Own Gourmet Chocolate Gift Baskets! Give a Dark Chocolate Gift Basket (the perfect chocolate birthday gift): Depending on what type of basket you'd like to make, here are some items you may need: basket, chocolate, fruit, gift. For the gift you might add the cookbook above. Select a beautiful basket; purchase truffles or add homemade fudge (recipe above). Fill the jar with the cocoa mix. Put a personalized label on it. Print the cocoa directions on cardstock. Punch a hole through the corner of the card, thread a ribbon through and tie the ribbon around the rim of the jar. Or you can use a personalized label. Add a bag of gourmet marshmallows from Whole Foods or your local health food store. Select a large basket to put everything in. Line the basket with a cloth napkin. A plaid one looks really cute! Add a few mugs and a small gift. Here are a few ideas: a chick-flick DVD like Bridget Jones Diary (my all time favorite! ), a good book, a pair of mittens or a knitted scarf. This hot chocolate gift basket will be a hit. Another great treat is homemade cupcakes. Make them special with these cute personalized wrappers! Fill the cupcake to really make them unique. And don't forget the birthday card!